Today marks the beginning of Crohn’s & Colitis Awareness Week. For those of us who suffer from forms of Irritable Bowel Disease (IBD), we know that while IBD patients may look healthy, they are suffering on the inside. Crohn’s disease is incurable and attacks the digestive system causing abdominal pain, diarrhea, rectal bleeding, fever, and weight loss. The pain can be diffuse depending on the site of the disease. The symptoms come and go as well and are aggravated by food. Like other forms of chronic pain, most of these symptoms are hidden and cannot be seen by others. Therefore, it’s often hard for others to relate or understand. Here is what you need to know about Crohn’s disease and chronic pain. The longer you experience pain without seeking treatment, the worse your pain will likely become. When a patient suffers from persistent pain, he or she develops central sensitization in the spinal cord and higher brain centers. This means that changes in the spinal cord lead to pain amplification. Basically, your nerves become more sensitive to all sorts of stimuli. The more sensitive your nerves become, the more pain signaling occurs in your central nervous system. This does depend on individual circumstances, but without proper assessment and treatment, your pain can become much worse. There are simple ways that you can battle this medically incurable disease. The key is consistency. Your life is more complicated with this disease, but you can make it as simple as possible by following these guidelines. Your primary care doctor may not have enough expertise when it comes to your gastrointestinal system. In addition to seeing a gastroenterologist, consider other specialists that are familiar with Crohn’s such as a nutritionist, and maybe even a radiologist and surgeon. After you see your doctor or specialist, they are most likely going to recommend a diet to follow. This will include eliminating foods that aggravate your digestive system (elimination diet). Some of these may be your absolute favorites, but not following the plan can be detrimental to your overall health. See your doctor regularly. If your doctor does not ask to schedule follow-up appointments, remember to do it yourself. In the end, you are responsible for your own health. Even if things are going spectacularly well, it’s always good to have a check-up. Because this disease is incurable, you must stay on top of it so that you can remain healthy and functional. Remember that if you do not seek treatment, your pain can worsen or spread, and lead to despair and debilitation. For instance, Crohn’s can also manifest in areas other than the abdominal region causing arthritic pain or blood clots. 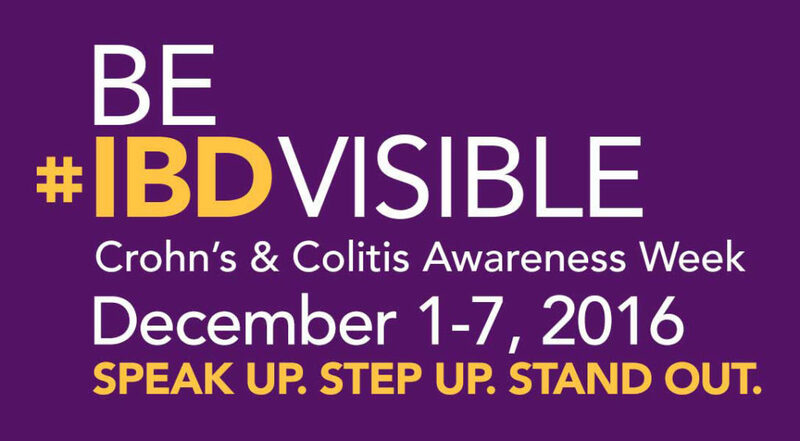 Take part in spreading awareness by using the hashtag #IBDvisible. Posted in Blog, Disease, Gastrointestinal, Uncategorized.